Doesn’t really start to get good until its second half, but boy does that second half knock your socks off. A creative film that divides itself up so that the first half is all about flashbacks of a characters life, and the second half is about the present day story of the character, in his misery, ready to commit suicide. It pretty much goes without saying that the second half is much more compelling. It’s not only about the character being in a dreadful state of mind, but getting the opportunity to reflect on his life by seeing what might have been if he was never born at all. This is definitely a take on A Christmas Carol, with the angel who comes down to take George on a tour through the changed town, representing the three ghosts from that Charles Dickens classic. Only there’s a little problem here. The angel and the change and present day story doesn’t really start happening until the second half of the film. That means that the first half is just okay, and occasionally pretty dull, whereas the second half is absolutely fantastic. There are many ways that the movie could have found a better balance and kept both halves on a more even playing field. Still, this is a pretty clever film that absolutely picks up momentum and creativity as it goes on. 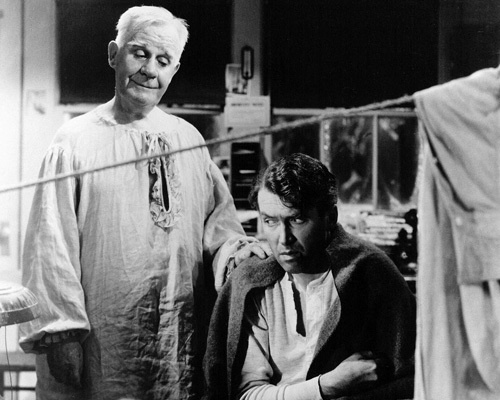 It’s A Wonderful Life is one of those Christmas Holiday classics that really isn’t much about Christmas at all. There are Christmas movies which are about the actual holiday and Santa, (Elf, The Santa Clause,) and other films which are about families at that time of year, (A Christmas Story.) It’s A Wonderful Life isn’t either one of these. It’s a movie about a man and his life and how everything gets put into perspective for him, as we get to look back on the things that have happened to him over the years, and then get to reflect alongside of him, on what life would have been like if he had never been born. 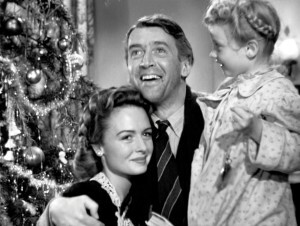 This is the movie of a businessman, named George Bailey (Jimmy Stewart,) who finds himself at a crossroads. Bailey is thinking about committing suicide. It’s not that he’s so unhappy with his life or anything like that. After all, Bailey has a loving wife and a number of terrific children. It’s just that Bailey owes a lot of money to a lot of people and realizes that he is worth more dead than alive. And so he finds himself out of options, standing on a bridge, ready to jump. Sounds kind of interesting, huh? The problem is that none of this comes out until the second half of the movie. Even the bridge jump doesn’t happen until the second half. A movie made about this topic today would most certainly begin with that, and then flashback to the start of the story to show us how he arrived at this point. Only It’s A Wonderful Life pretty much saves everything for its second half. The first half is all about showing events from Baileys life, leading up to what might make him have a problem. We see a variety of scenes from different moments in the character’s life, and the meaning of all of them doesn’t come until much later on in the film. This leads to the first half of the movie being kind of lousy and the second half being great. It’s unfortunate, becomes things could have been spread out much more evenly, and instead feels in many ways like two different films. This is definitely a movie that rewards patience. The film opens with the stars in a nighttime sky glowing as we hear the voices of two characters conversing with each other. The first voice belongs to an angel named Clarence. The second belongs to someone who Clarence refers to as Joseph. He’s the boss. Joseph is either the head of the Angels or god or both, and he is sending Clarence on a mission. The mission is to save George Bailey. You see, many people have prayed on this very same night for god to watch over and save Bailey. And sending Clarence down is Joseph’s response. But first, Clarence needs to watch a series of clips of Bailey, taken from throughout the man’s life, to get an understanding of who this man is. This is like Defending Your Life, and could have been really cool if we got some kind of commentary before or after each clip from the two characters watching them. That’s what Defending Your Life did. It wasn’t just a series of clips, but commentary and reactions to the clips from the characters. Albert Brooks was literally defending the actions he took in the clips. Now, obviously Bailey can’t be doing that here, A Christmas Carol-style (with Scrooge standing alongside the spirits, giving the reasons for why he did certain things,) but at least the two angels could be responding a little more. Instead, we just watch George growing up. The childhood scenes get things started out pretty good. There’s a great moment where George saves his brother who has fallen through the ice. George uses his head to break the ice and loses hearing in one ear. Then, while working at a pharmacy, George catches a mistake the elderly pharmacist is making where the man accidentally puts poison into medicine bottles. George stops the pharmacist from doing this. While these clips are pretty interesting, it isn’t long before we transition into ones that are much more dull. These are the clips of the adult George finding romance and work. The story of George is that of a man who had great dreams and ambitions and was never able to make it out of town. He kept having to cover for people and help others out and sacrificing his own aspirations in order to do so. On his wedding day, for example, right after getting married and starting to head out with his wife to their honeymoon, George stops off the bank when there is a problem and tries to save the day. That means getting mixed up in a whole big issue where the bank has lost a ton of money and now owes it to the people who were keeping money there. This is where the movie starts to get pretty dull. There is this one bank scene, and then not too long after it, a whole other bank scene. In the second one, it is again not George’s fault at all, and yet he steps in to take the blame. This time a man who works for the bank has lost all the money, and George feels that the responsibility rests on his shoulders. The problem is that we just saw a bank scene very similar to this one. It’s a problem of too much of the same thing, and none of it being all that exciting. Luckily things pick up in a major way in the second half. Gabriel comes down and makes it as if George never existed at all. Then he takes George on a tour of the town, which is now completely different in every way. From the attitudes and anger people he used to know, now have toward strangers, to the men his brother saved on the battlefield, or George saved by stopping the pharmacist, to the name of the town itself, (it goes from Bedford Falls to Pottersville, now named after the evil mean in town who is George’s nemesis throughout the film,) the whole world seems different. Even George’s house is not there, and both his wife and mother seem miserable. The idea of looking back on ones life and getting the chance to reflect is a pretty cool one. It’s certainly what made A Christmas Carols such a timely story. But that was a tale where two parallel stories were sort of happening alongside of each other. There was the character, Ebineezer Scrooge, in his daily life, getting visited by ghosts, and then there were the little scenes and stories told through flashback as he and the ghosts paid visits. It’s A Wonderful Life might have benefited from taking a similar approach, and running the two stories side by side. As it is, the whole first half is the story of the past, and the whole second half is the story of the present. While it’s understandable, why the movie did it this way, the result is that the first half is just a little too dull. It isn’t nearly as compelling or creative as the second half is. Still, the movie has some great creativity to it, and really gives us a powerful and fascinating second half. There’s a reason why this is a Chistmas-time classic, even if it has very little to do with Christmas. It’s because this is a pretty epic feeling, family-friendly, positive energy kind of film. The movie might not be about Christmas, but it sure does capture the Christmas spirit.